Looking for some freebies on Veteran’s Day 2018? The national holiday will occur on November 11th and be observed on Monday, November 12th, 2018. Veteran’s Day was originally founded as “Armstice Day” by President Woodrow Wilson on November 11th, 1919, the first anniversary of World War I and eventually become a way to commemorate all who have served our country. 4 Rivers Smokehouse: All veteran’s and first-responders (with valid ID) will receive a complimentary sandwich at their local 4 Rivers) on Monday, November 12th. Applebee’s Grill + Bar: All veterans and active-duty military can enjoy a free full-size entree Sunday, November 11th, from a selection of eight dishes. BJ’s Restaurant + Bar: Free meal up to $12.95 + free Dr. Pepper Sunday. Bonefish Grill: Free bang bang shrimp on Sunday, November 11th. California Pizza Kitchen: Free meal from special menu on Sunday, November 11th. BOGO card valid November 12th to November 18th. Cici’s Pizza: Free adult buffet on Sunday, November 11th. Denny’s: Free Build Your Own Grand Slam from 5AM to 12PM Monday, November 12th for active, inactive, and retired military personnel. Grimaldi’s Pizzeria: Men and women who have served can enjoy 15% off their bill on Sunday, November 11th. Alcohol excluded. Not valid in NY, NJ, or CT.
IHOP: Free Red, White, and Blue pancakes or patriotic pancake combo on Monday, November 12th from 7AM to 7PM. Longhorn Steakhouse: Free appetizer or dessert on Sunday November 11th. Miller’s Ale House: 50% off meal on Sunday, November 11th. Shake Shack: Free scoop of Shake Shack custard on Sunday, November 11th. Sonny’s BBQ: Free pulled or sliced pork big deal combo for veteran’s and active duty on Monday, November 12th. Dine-in only. Starbucks: Free tall hot brewed coffee on Sunday, November 11th. Texas de Brazil: Two veteran’s dine complimentary and 20% off for up to 6 more guests on November 11th and November 12th. Texas Roadhouse: Free lunch from special menu on Sunday, November 11th for active, former, or retired military. Dine-in only. Tijuana Flats: Free entree and drink Sunday with military ID. Dine in or take out. Limit 1 per person. World of Beer: Free draught beer for veteran’s or $5 off your bill. Zaxby’s: Free chicken filet sandwich on Monday, November 12th. Brandon Harley-Davidson: Free food and drinks for all veterans, active duty, and retired military personnel on Saturday, November 10th from 11AM-3PM. 20% off general merchandise official licensed products. Fresh Harvest at Seminole Hard Rock Hotel & Casino Tampa: 2-4-1 buffet or 50% OFF buffet. $20 in free play will be offered to veteran’s (must visit Player’s Club to redeem). Prost Kitchen + Bar: Free meal for active/retired military on Sunday, November 11th and Monday, November 12th. Tampa Bay Grand Prix: $10 per race special all weekend for all veteran’s and their families. National Coffee Day is this Friday, September 29th, 2017! Plenty of great coffee shops around Tampa Bay will be celebrating with deals and discounts. Forget Krispy Kreme and Dunkin Donuts – grab yourself some REAL coffee during this celebration. The Lab (North Hyde Park): Public cupping beginning at 11AM on National Coffee Day. Caffeine (Downtown Tampa & South Tampa): 40% OFF single origin coffee beans. Slow Bar Deals: $1 Aeropress, $1.50 V60, $2 Chemex. $1 Cold Brew Drive-Thru Only Special. Buddy Brew Coffee: BOGO Cold Brew when you bring a friend. Any other local shops doing deals or freebies? Shoot me an email at carloseats[at]gmail[dot]com. 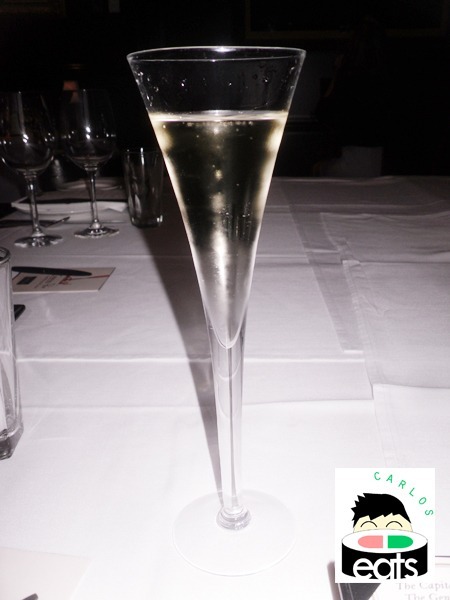 I attended the Capital Grille’s Generous Pour Preview Event on Monday night. 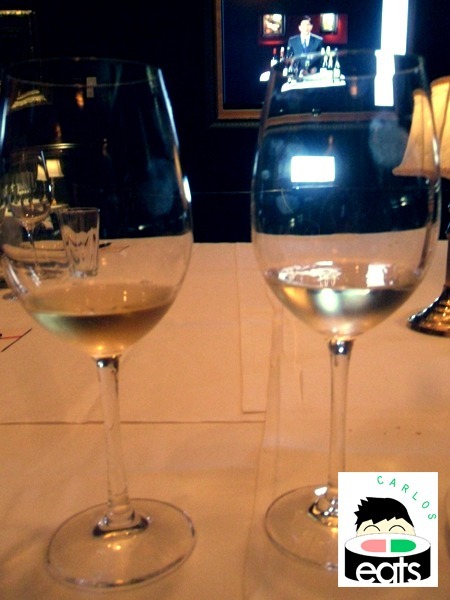 The Generous Pour Wine Event will occur from July 12th to September 4th, 2011 at Capital Grille locations. This event will feature a collection of nine wines from around the world, each hand-selected by The Capital Grille’s Master Sommelier, George Miliotes, one of only 173 Master Sommeliers in the world. Guests can enjoy as many wines from the list as they like for only $25 per person with dinner. The preview event occurred at Capital Grille locations around the country and was an opportunity for select media to taste the wines on the list and pair them with the dishes provided with recommendations and a live webcast from George Miliotes. Participants used the Twitter hashtag #TCGPour11 to discuss the event and could ask questions to Mr. Miliotes via his twitter username @TheWineExpert. This post is longer than usual due to the complete menu we explored, in addition to the wine pairings we compared. Feel free to skip ahead to what interests you most. I have broken the post down by course. We were immediately greeted when we arrived and taken to a private room in the back for the event. The room had a single table with chairs around and a television screen where Mr. George Miliotes would soon be introducing us to the wines we would be tasting. The waitress assigned to us was great and quite knowledgeable about all the wines and dishes. She was always smiling and was a nice addition to the experience. There were many ways Capital Grille could have executed this event and, in my opinion, they chose to make it as intimate and involved as they possibly could. The conversations with George over Twitter were extremely interesting as he advised other media members. Originally the webcast almost felt unreal, until I checked my iPod Touch and saw the questions he was answering posting live by fellow local users in Orlando and Atlanta. He answered one of my questions in regards to a sweet red wine, but not too sweet…recommending a sparkling Shiraz like the black chook. 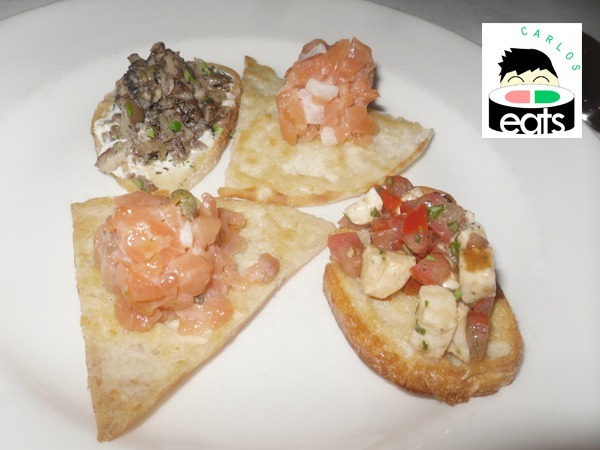 The first thing we were offered were three hors d’oeuvres: smoked salmon on onion pita crisps, fresh tomato and mozzarella crostinis, and wild mushroom and boursin crostinis. The wine paired with the three was Marquis de la Tour, Cremant de Loire Brut, France. All three hors d’oeuvres were appetizing and light and the Marquis de la Tour was light and not empowering the hors d’oeuvres. 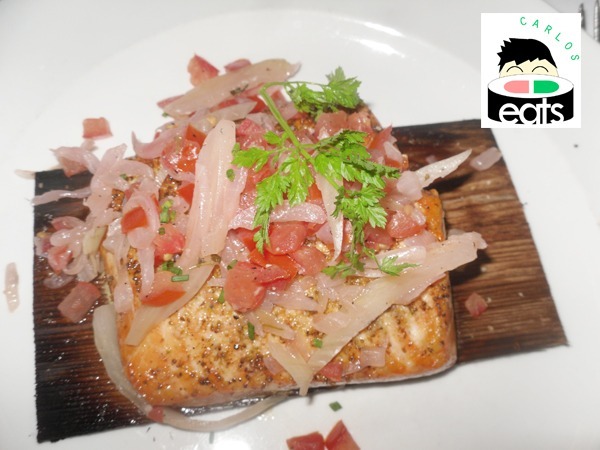 The salmon was pleasant in taste and smoked just right, there was no fishy aftertaste. The wild mushrooms and boursin crostinis were tasty as well. Our personal favorite was the fresh tomato and mozzarella crostinis. They left a “WOW” factor in your mouth after each bite and complemented the sparkling white wine’s light and crisp taste perfectly. The bread they brought us during the wait for the appetizers was also delicious, although we had to leave some space for the appetizers, entrees, and desserts soon to come. For the appetizers and entrees, two wine pairings were suggested for each dish and Mr. Miliotes encouraged us to make our selection on whether we preferred new world or old world wines with our food. 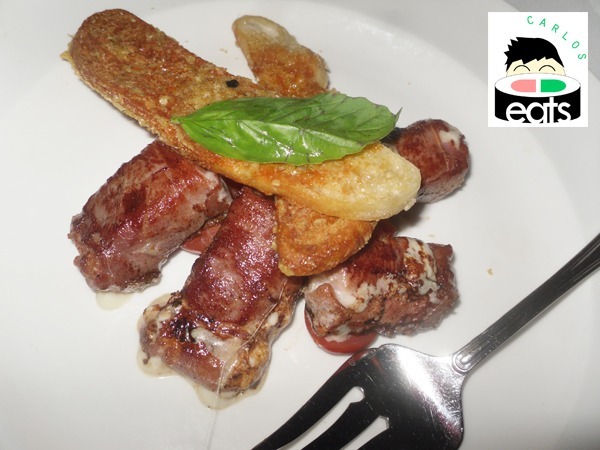 The two appetizers being provides were pan fried Calamari with hot Cherry peppers and prosciutto wrapped mozzarella with vine ripe tomatoes. 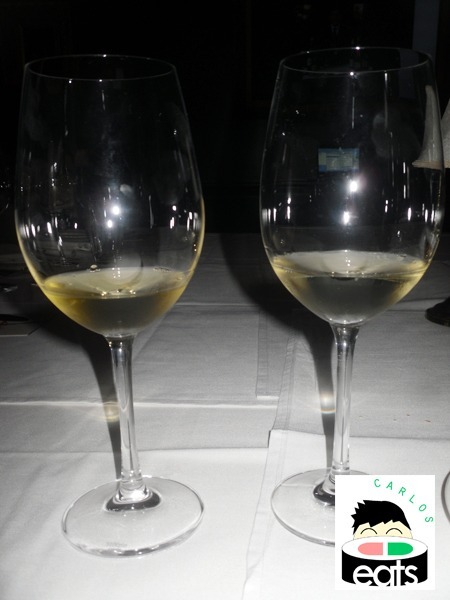 The two wines being offered were La Cana Albarino or Chateau St. Jean, Belle Terre. For the calamari, we chose the Chateau St. Jean, Belle Terre wine as our favorite. Although the La Cana Albarino washed it down best, we felt the Chateau St. Jean provided the best finishing touch. We chose the La Cana Albarino as our choice for the mozzarella. It had a subtle taste we really enjoyed. The calamari was excellent and full of flavor. In the past few years I have started eating calamari regularly and this one did not disappoint. The mozzarella wasn’t too heavy and still had a great texture. 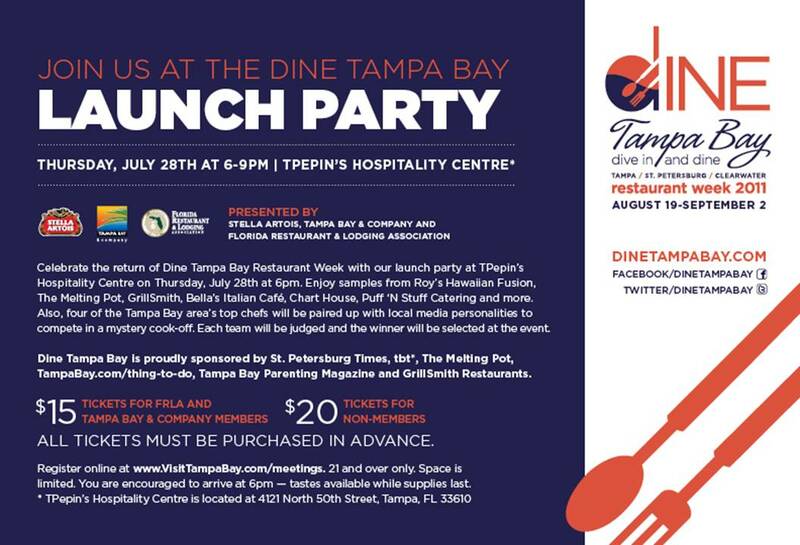 Most preview events allowed the media to pick one entree, but due to a few no-shows at the Tampa location, we were able to test out the wines with all three entrees! The bone-in kona crusted dry aged sirloin with shallot butter was phenomenol. Our favorite of the three entrees. 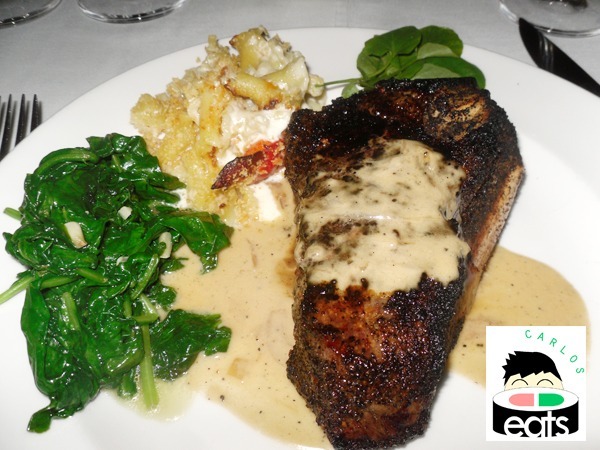 It has a fantastic taste to it, the waitress noted that Capital Grille ages their steak in-house and they do it well. I ordered it medium and the deeper you went into the steak, the better it tasted. It has a smokey like taste that went fantastic with the wine we chose: The Chalk Hill Estate, Cabernet, Savignon, Sonoma, which had a volcanic chalk taste. The wine perfectly finishes the sirloin. The salmon was our second favorite. Now I love sushi, but I tend to hate cooked fish. Something about it always leaves a bitter aftertaste in my mouth. However, Capital Grille’s cedar smoked salmon with tomato fennel relish left no bitter aftertaste and was filled with a savory, lemony flavoring that left me in awe. The Byron Pinot Noir, Santa Barbara, 2009 was paired with the salmon for it’s moisture and although white wines are normally paired with seafood, we found the Byron Pinot Noir to be a great addition to the salmon. The 10 oz. filet mignon was enjoyable, but perhaps the only dish we felt we could have been replicated at another restaurant, though the wine pairing was what really made this dish awesome. We appreciated the crunchy texture to the spinach, it wasn’t soggy and flavorless. The lobster macaroni and cheese was also delightful, with large pieces of lobster present throughout. 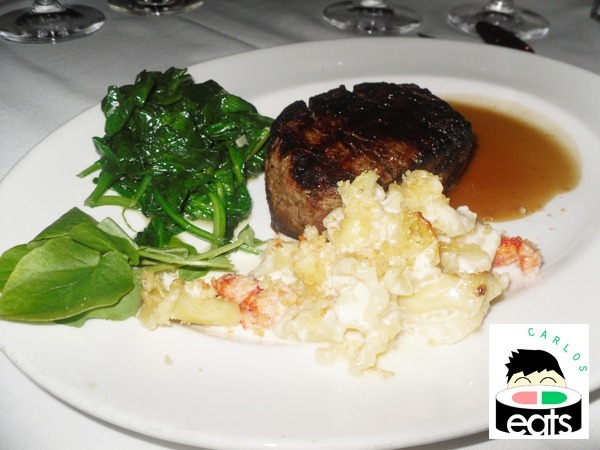 The filet was cooked medium and our choice wine for this dish was Tarima Hill, Monastrell, Alicante, Spain, 2009. It had a subtle taste that didn’t overpower the taste. The vanilla taste was a nice final touch. The wine is new and we were among the first people around the United States to try it. 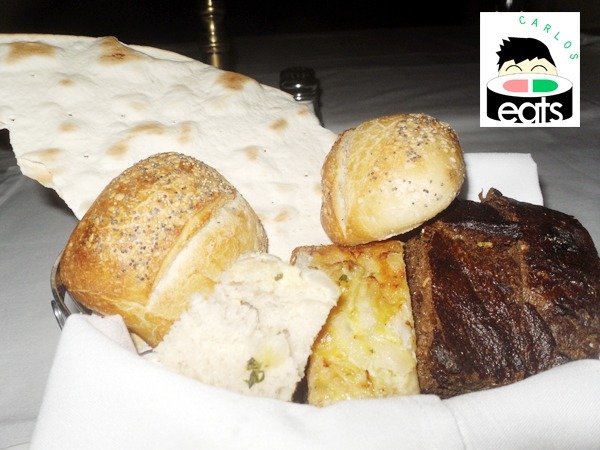 You can now enjoy it at Capital Grille locations until it becomes commercially available in August. 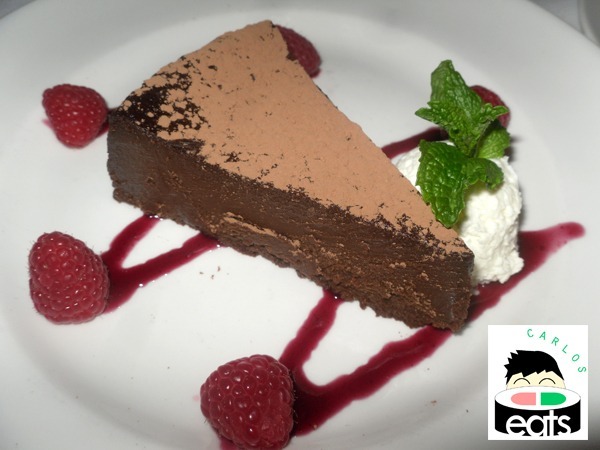 As if we could still manage to eat after sampling so much food…it was time to eat dessert! The two dessert choices: flourless chocolate espresso cake and strawberries Capital Grille were served with RL Buller, The Portly Gentle, which is an Australian take on classic Port dessert wine. 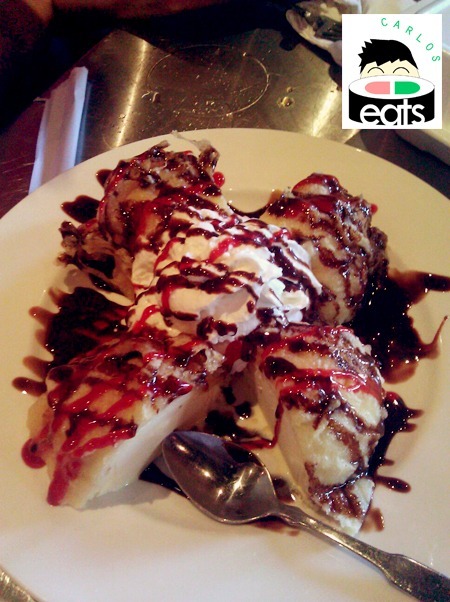 Both desserts were great with a fresh taste to the fruits. They were a nice to end to our meal and the flourless chocolate espresso cake was so good, I attempted to finish it all despite being completely full. 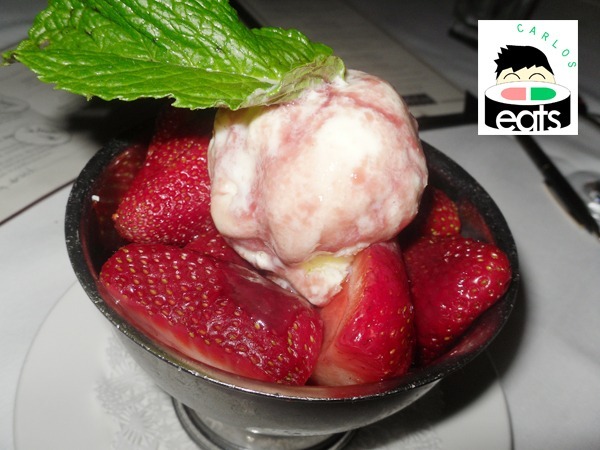 It was a solid dessert packed with flavor. We also feel this dessert best matched the wine pairing. 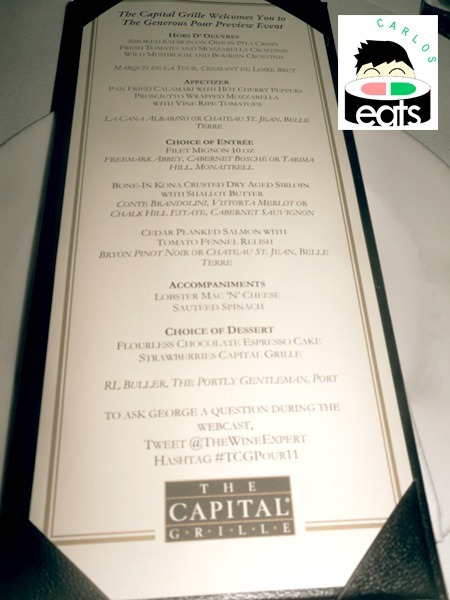 Overall, the food and hospitality at Capital Grille was great and the wine pairings were even better. When we left we were given wine bottles with gift certificates as a token of their appreciation along with with the leftovers of food that have stocked my fridge, truly a generous pour event. The $25 summer deal for these wines is great for diners and wine aficionados to fully explore their dishes. I have been by SoHo Sushi North numerous times, but never stopped in until this past week. It is the same plaza as the fantastic Wood Fired Pizza, and these two restaurants really do make this plaza boom with foodie activity. I first heard of SoHo Sushi when they became a sponsor for the Japanese Club at USF‘s “A Night in Tokyo” cultural event (a Japanese cultural-themed dinner). We came during their “Happy Hour” which is from 5:00PM-7:00PM everyday and offers $5-7 special rolls and appetizers as well as 2-4-1 house wine, draft beer, and hot sake. 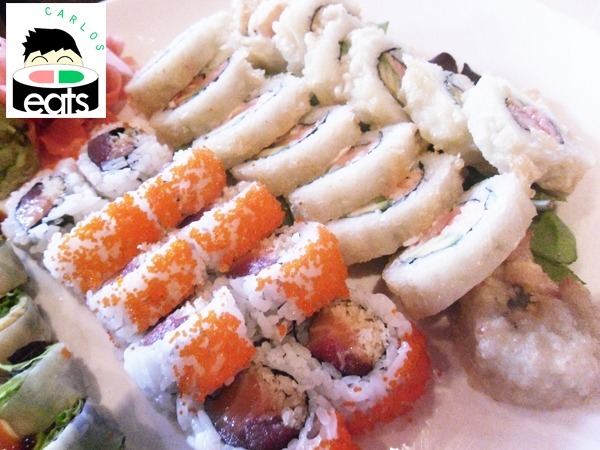 USF students can get 10% off with their student ID making SoHo Sushi North affordable for the college students nearby and for diners who don’t mind having dinner early. We decided to order two appetizers: their $5 Sunomono (cucumber salad topped with crab, steamed shrimp, octopus, and fined with rice wine vinaigrette) and $6 Geso (Japanese style calamari, flash fried and dressed in ponzu sauce). The sunomono was excellent and had a very refreshing taste to it. It was a nice start to our meal and whenever we wanted to refresh our taste buds throughout our meal the rice vinaigrette really hit the spot. 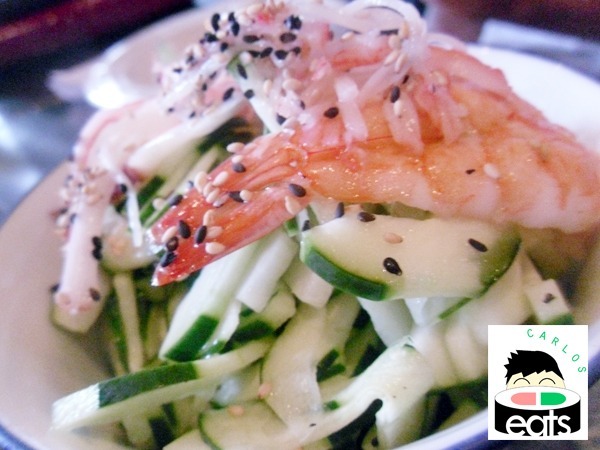 The shredded crab and shrimp were delicious and although I don’t like cucumbers on my sushi (I feel it detracts from the taste of the fish), I love cucumber on the side with some sauce. There was enough for two people to share so I say $5 is not a bad price for some sunomono. The geso was quite a change in taste buds from the sunomono we had before it. The calamari was a little rough, but still quite tasty and the ponzu sauce was the best part of this appetizer. We could have dipped almost anything into the sauce and been happy. Although the geso wasn’t my favorite food of the night it was pretty good and I think I would try it again and see if maybe the chef just timed the cooking a little off on the appetizer. 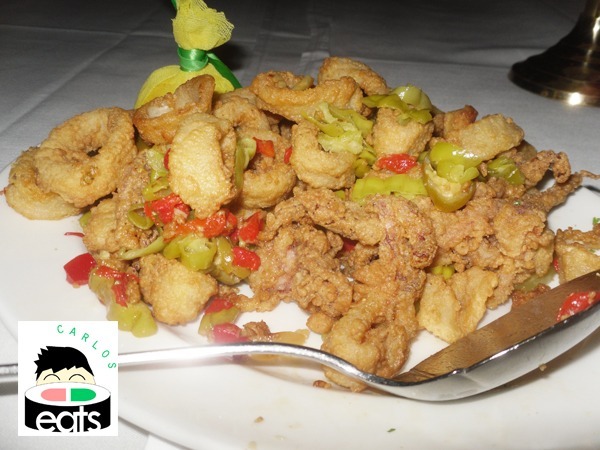 $6 is a great price for calamari. 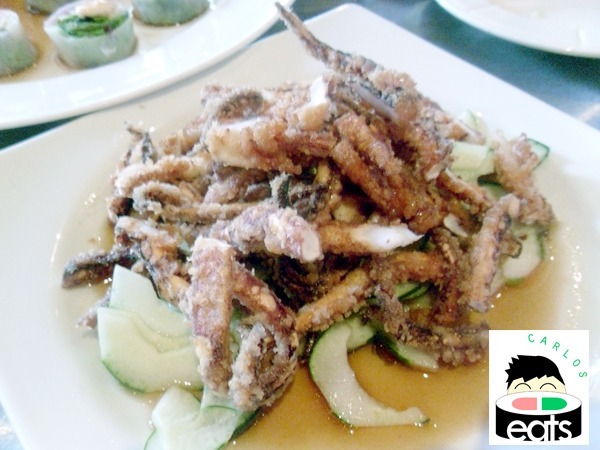 It is a nice switch from the usual calamari found in most restaurants and the batter was noticeably less greasy as well. We decided to order four rolls and went with the K-Town Roll ($6), Lobster Tempura Roll ($6), SoHo Roll ($5), and Tuna Fresh Roll ($7). They came rather quickly and it wasn’t long before we had a pile of food in front of us. The Lobster Tempura Roll (top right) was tasty on the inside, but the outside tasted a little odd…like the tempura didn’t reach the amount of crunch one desires when having a tempura roll. Still definitely worth the price, but a little off what we wanted. The fish was good in the other rolls, but the mayo was a little off-putting. My friend mentioned that the mayo tasted American and I couldn’t help but agree. The mayo was detracting from the roll and indeed the two rolls that had mayo on them would have been better without it. 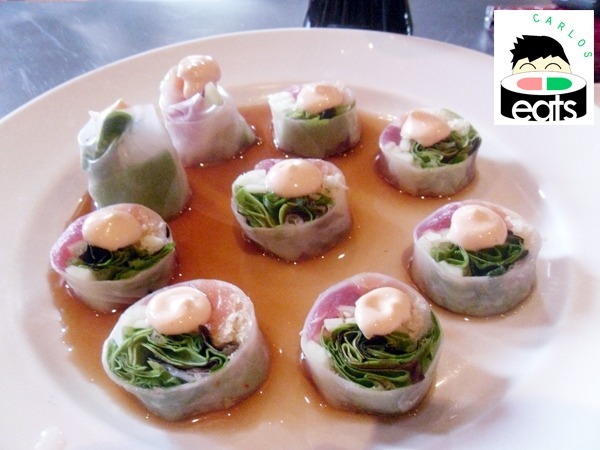 On the other hand, the rice paper was a refreshing change from your average sushi roll and kept the sushi from becoming too heavy. I also thought the tuna and salmon were both appetizing and my friend commented that the tempura chips were great. 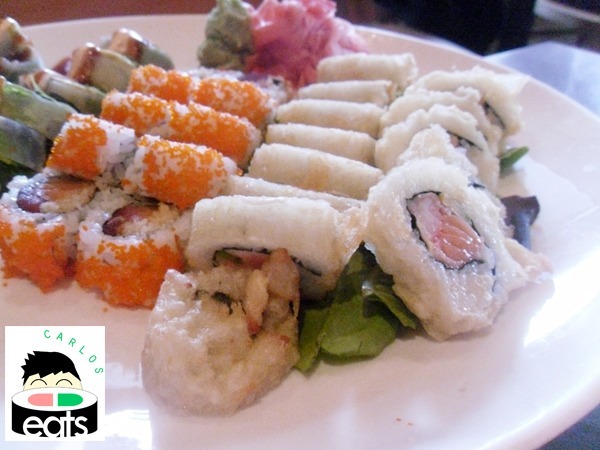 Overall, I would say the sushi at SoHo Sushi North was good, but not the best I have had. 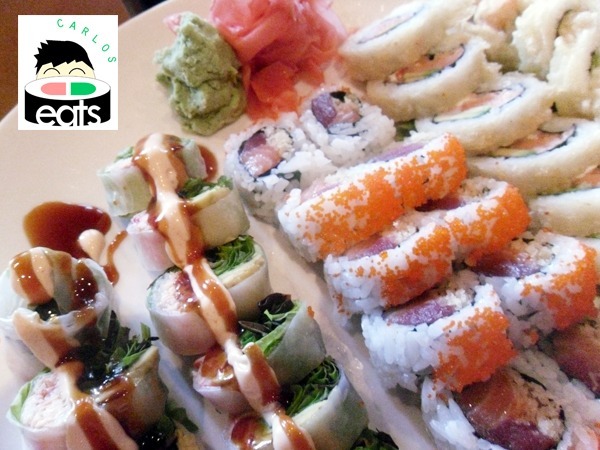 They face fierce competition in the area with Tomo Sushi and Joy of Tokyo within a few minutes of driving distance and Tokyo Sushi Japanese Restaurant down on Fowler Avenue. SoHo is really a seller because of the good deals they offer with their Happy Hour and USF 10% student discount that few sushi restaurants will match nearby. With the rough economic times everyone faces today you can’t deny a good deal. As we were about to close our check we decided we would have some dessert and order their fried ice cream for $6 (pictured below). The ice cream tasted satisfactory (not too sweet and the fried piece on top was a pleasant finish) and was a nice close to our meal. 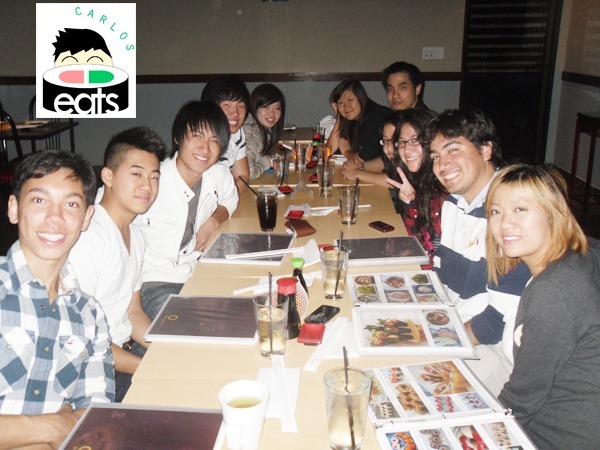 I dined at Origami Sushi on Waters Avenue for my friends birthday a weeks back. The place has a great ambiance, it was so dark that we couldn’t read the menu correctly until they turned up the lights a little bit…plenty of couples were in the restaurant. The restaurant had plenty of space so our party could have its own area in the back. The hosts and waitresses were very attentive and helpful with whatever we needed to have a great birthday dinner. One thing I noticed was that there was a picture for every sushi roll on the menu so you knew what a roll such as their Halloween Roll would look like, not many restaurants will go that far and it was a great idea that I wish more restaurants would practice.